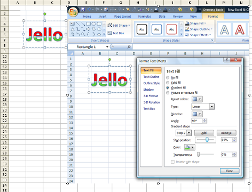 I have had over the years, a few people inquire as to “HOW” do I make clip-art with Excel®? I have thought about writing a book on the subject upon several occasions. I do not know IF there would be a market for this type of information, or how many people would be interested in what I have to offer. There are some negative thoughts on trying to get this book published (e.g. limited market appeal, my techniques, may only work with up to version 2003 Excel®). On the positive side this information MAY appeal to creative, or the do-it-yourself individuals, who already HAVE Excel® installed on their personal computer. Why draw with Excel? Check out this 6 minute presentation if you’d like a glimpse into how shapes can be used to make clip-art or how photographs can be used as inspiration for making clip-art. Depending on your computer and internet speed it takes about 5 minutes (or 6 minutes) to download this show to your PC. This presentation is based on earlier versions of Excel but similar results can still be achieved in later Excel versions with some slight modifications to the techniques used. After clicking on hyper-link to kiosk show, you can press the ESCAPE button on your keyboard at anytime to stop the presentation. If you’ve never viewed anything using the MS Video/Windows software a window will open asking if you want to download the software, if it does then click on recommended settings. It may take a few minutes for this to download. Once download is complete you should be able to click on the box and the video will show a black screen then will start automatically. The presentation itself, is about 6 minutes in length. I have Windows 7 and I’ve been able to view this show using IE version 11 as well as thru Google-Chrome. I’ve been informed that folks with Windows 8 have issues opening this show. 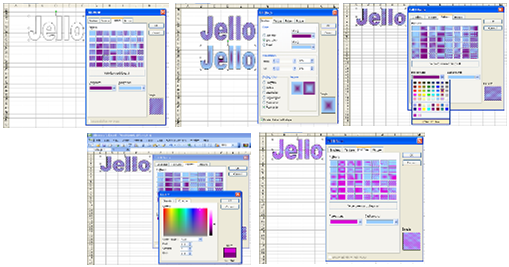 · There are OTHER “better” programs out there for creating clip-art that work better than Excel®. Probably TRUE– but they also may COST more than the “average” person (who is NOT a graphics professional) would be willing to spend. These “other” programs may also be more complicated for an average person to use. The average person may not have a need to create their own clip-art very often, but when that need arises, wouldn’t it be nice to know HOW it CAN be done on Excel®? My book tells HOW to do this . . .
· Most of the techniques I discuss in my book are for the 2003 Excel® version, and some of the earlier versions, some techniques may not work with the NEWER 2007 version? Maybe TRUE– but I’ve managed to make my techniques work with this newer version too. · Some people (who may not be computer pros, but average users) may dislike MS’s new OS system for 2007 (Windows Vista). Which interesting enough, is NOT compatible with MS Office 2003 programs, but will work with the new MS Office 2007 . . . Almost sounds like MS wants you to purchase their Office (Excel) 2007 package, huh? · For average PC users who’ve just gotten the knack of using the same MS Office layouts (for Excel® & Word) over the years, they may have a challenging time making the switch-over to the 2007 version and most likely will probably be more comfortable with the 2003 version. Especially if their frequency of using Office programs is limited. I do know of at least one person who was so upset they were unable to load their Office 2003 into their new PC, that they had the MS 2007 Windows Vista removed so that they could put in Windows XP that is compatible with their Office 2003 program package. It boils down to a matter of personal preference, in which everyone will have to decide whether or not they want to use the new Office 2007 version. · Personally I feel that the new options in the Excel® 2007 version are more user friendly for folks who analyze data and crunch numbers which is what this program was designed for (and what I do at my job). I admit the new version is not very user friendly for extensive drawing applications. However, I must concede, that it has neat charting options and isn’t as temperamental as previous versions were when handling large amounts of data & numbers. What things do I discuss in my book? 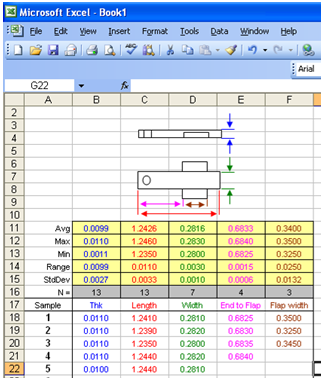 · The drawing tools which are offered in Excel®, and how to access/open up these drawing tools. 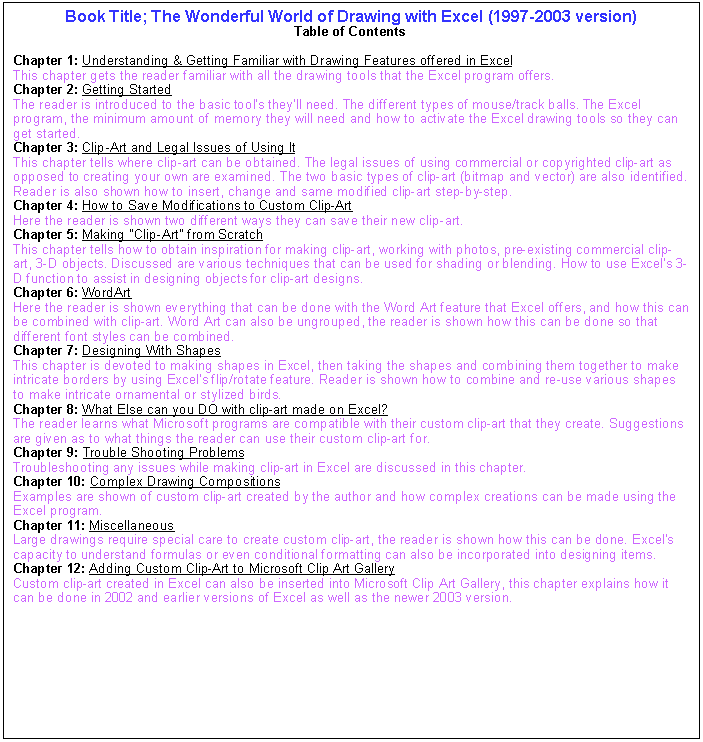 · How to use commercially available clip-art, insert/import clip-art into Excel®, how to make modifications to clip-art and how to SAVE the changed clip-art. 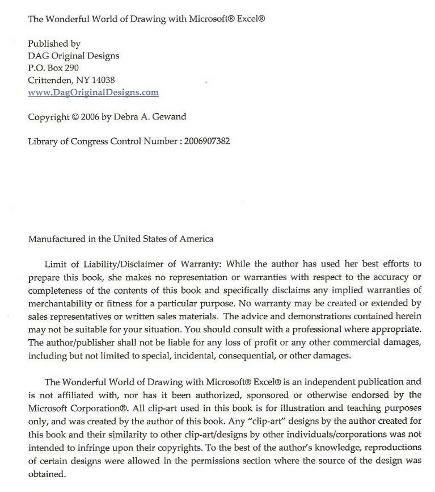 · The “legal” ramifications of using commercially available clip-art are discussed. · I teach how to create your OWN clip-art from scratch. Where to find inspiration, making shapes over your inspiration and even combining multiple resources to make your own clip-art. · I touch upon using the 3-D function in Excel® to create with. Some cool stuff you can do with WordArt, how-to ungroup WordArt (so that you can use the shapes to make your OWN letters or incorporate into other designs). 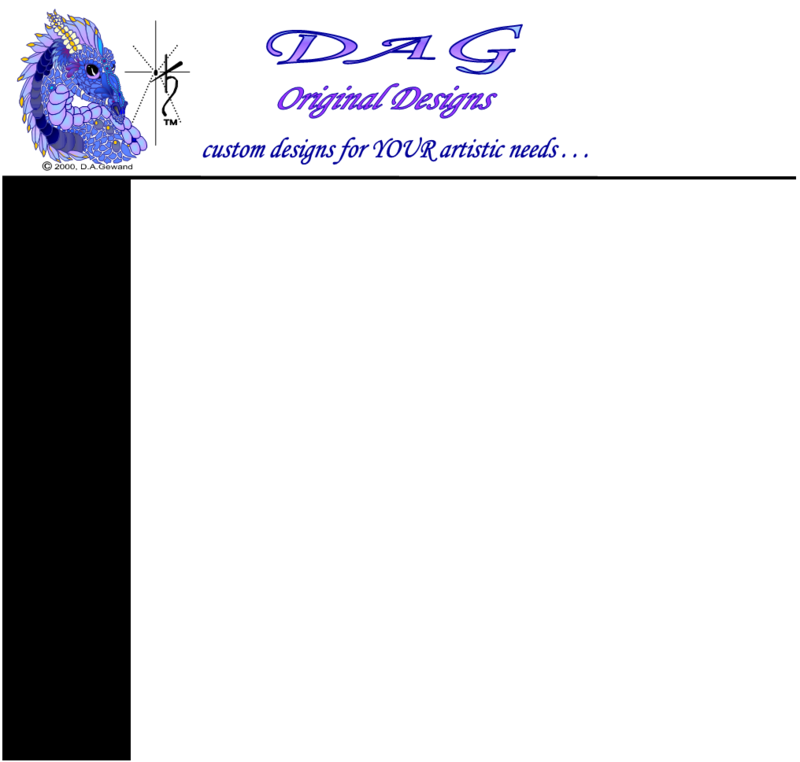 · Combing “shapes” to make patterns for borders (for frames or certificates) and how to make ornamental or stylized designs. · Also included are trouble-shooting graphic issues, complex drawings and how to use formulas or conditional formatting in designs/layouts. Description: The book discusses HOW TO use the Microsoft® Excel® program for numerous graphic and visually creative applications. I show step-by-step how to use commercially available clip-art, touch upon the legal issues surrounding the usage of commercial clip-art, how to manipulate/change clip-art and how to save your changes. I show how to create clip-art from scratch and use the 3-D, shadow, or WordArt (and other) functions with creating your designs. I show what you can create YOURSELF, without going to a professional graphics designer or printer. I discuss trouble-shooting any graphics issues, making complex drawings, and using formulas or conditional formatting in your design layouts. The book comes with a companion CD and eleven Excel® databases that you can manipulate yourself to create: business cards, brochures, posters, certificates, calendars w/ personal photos, raffle tickets, etc. There are also three workbooks that contain examples from my book that you can take apart step-by-step. 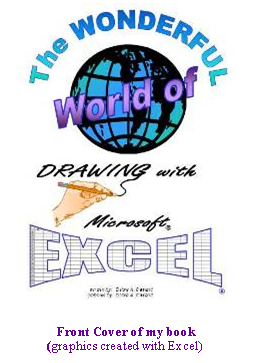 Disclaimer: The Wonderful World of Drawing with Microsoft® Excel® is an independent publication and is not affiliated with, nor has it been authorized, sponsored or otherwise endorsed by Microsoft Corporation®. All clip-art used in this book is for illustration and teaching purposes only, and was created by the author of this book. Any similarity to other clip-arts or designs by other individuals was not intentional. · Although some of the tools I currently use to make clip-art seem to have been eliminated in the newer version (e.g. pattern options and 2 color fill option, for example– see diagrams below), my drawing techniques still work. I do have the 2007 version on one of my PC’s, it has a different set-up (with index tabs located at the top), and for many it will take some getting use to how the new layout in Excel® functions, and navigating this new set-up. This new version doesn’t allow you to custom design your own “tool bar” to be visible & accessible whenever you open the Excel® program, in the 2003 version I can set-up all my favorite drawing tool icons for easy instant access. In the 2007 version, I have to dig thru layers to find the commands I want, making it not very user friendly for drawing applications at times. I can not seem to find these features in the 2007 version. You can make changes to get two different colors from the “GRADIENT” option, but you won’t get the subtle blending of colors as in the 2003 version where the colors fade into each other, (see comparison sample below). 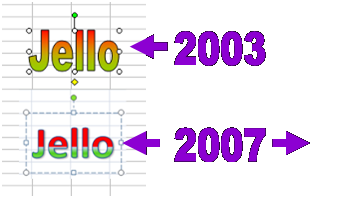 The “PATTERNS” in the new 2007 version only seem to be available for formatting CELLS but not for Word Art or Shapes. 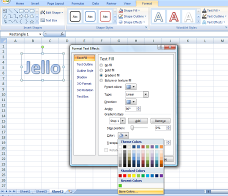 The multi pre-set color option is the only thing that seems to still be available in 2007 version for Word Art and Shapes. It’s possible that the commands exist to get patterns or a more blended customized two-tone color, but as of this writing I haven’t been able to locate this option. The 2003 version lets you create a “custom” toolbar that will be displayed whenever you open up the Excel program. In my case, I have a “drawing” tool bar which I use. Okay some folks are wondering WHY I’d use Excel to create “clip-art” or drawings? If you are a book publisher and you’re curious as to what chapters are in my book and what features I cover they are listed in the outline at the right. Since the 1997-2003 version seems to offer the best options for drawing, my book concentrates on this version rather than the 2007 & up version.